HELP THE PRESENTERS & PLEASE TAKE THIS PRE-WEBINAR SURVEY! 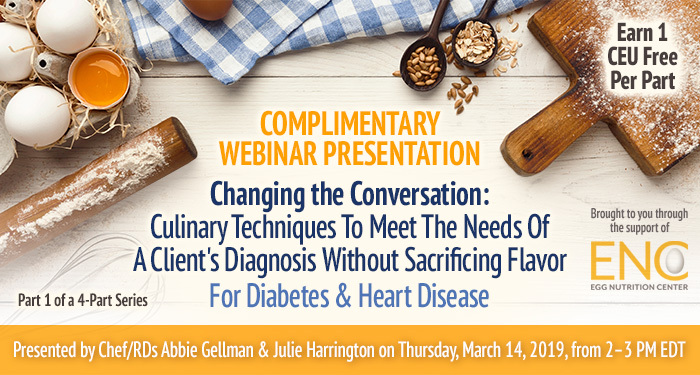 Thanks for registering for this Thursday’s webinar, "Changing The Conversation: Culinary Techniques To Meet The Needs Of A Client's Diagnosis Without Sacrificing Flavor For Diabetes & Heart Disease", Part 1 of a 4-Part series on culinary techniques hosted by these accomplished Chef/RDs. Our presenters, Abbie and Julie, would like to ask you a few questions ahead of time so that they can tailor the presentation to your needs and understand their audience prior to the webinar on Thursday. Please take a couple of minutes to answer the 3 short questions in this survey, the responses from which will be sent to the presenters for review before the presentation.